Clinical introduction A 59-year-old woman visited an outpatient cardiology clinic due to shortness of breath on exertion. Physical examination showed no significant abnormality of vital signs. A III/VI systolic murmur was heard on the fourth intercostal space at the right sternal border. The majority of laboratory tests were normal. Chest X-ray showed a curved vessel shadow (figure 1A). 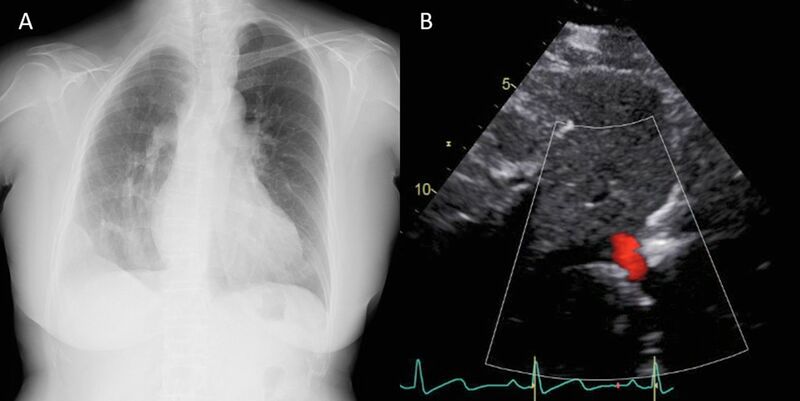 Initial transthoracic echocardiography showed abnormal blood flow into the inferior vena cava (IVC) in the subxiphoid long axis view (figure 1B) and mild right heart dilatation (online supplementary figure 1). Transoesophageal echocardiography showed severe tricuspid regurgitation (online supplementary figure 2). (A) Chest X-ray. (B) Colour Doppler image in the subxiphoid long axis view. Question What is the most likely underlying disease for the patient’s shortness of breath on exertion? Contributors TK drafted the manuscript and prepared the figures. HM and ST contributed to the conceptualisation of the manuscript. Ethics approval The research committee at Hokkaido Cardiovascular Hospital.